Elyse Grams is the featured artist at Provenance Gallery during the month of December. 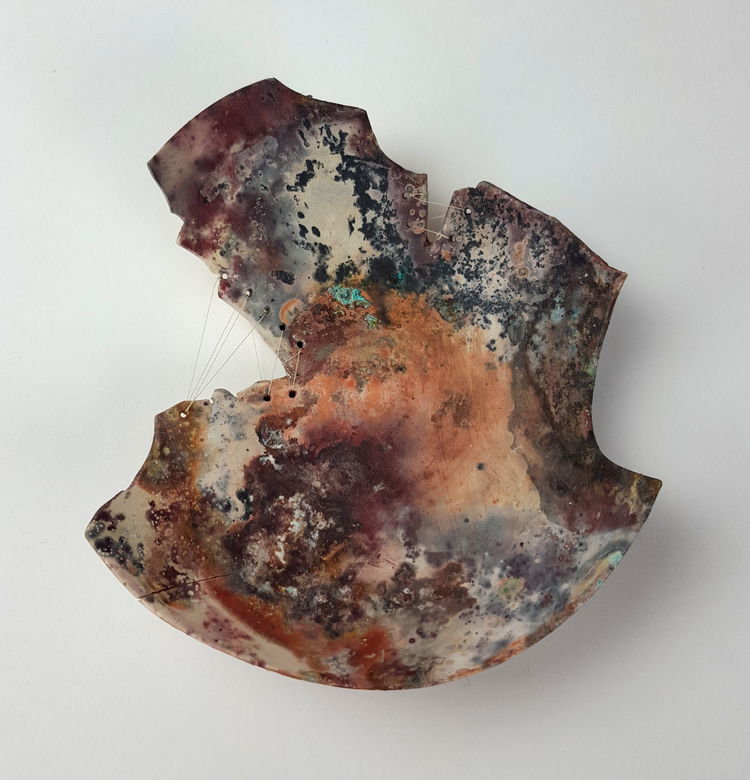 The work that will be on view is from her "dysfunctional pottery" series in which she takes beautifully crafted ceramic vessels and alters them in such a way that they can no longer serve their original purpose. The vessels are broken, missing sides, slit open in spaces that are later mended, woven with yarn or sewn up with string. They remain beautiful, despite the loss of functionality and are meant to represent how we, as a society, hide our own brokenness and grief. 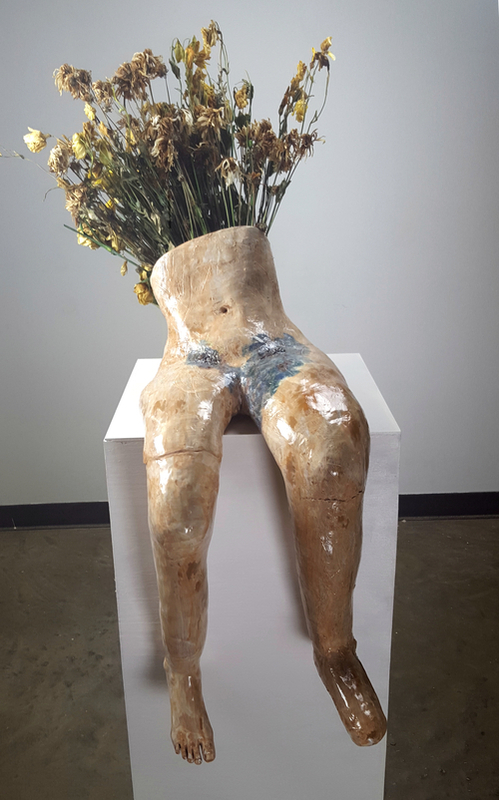 My Body is Not My Own, Ceramic, Mixed Media. Image Courtesy of the Artist. I grew up lucky enough to be surrounded by people, while not artists themselves, who were incredibly supportive of the things that I wanted to make. I read voraciously and I am incredibly interested in history, particularly women in history. 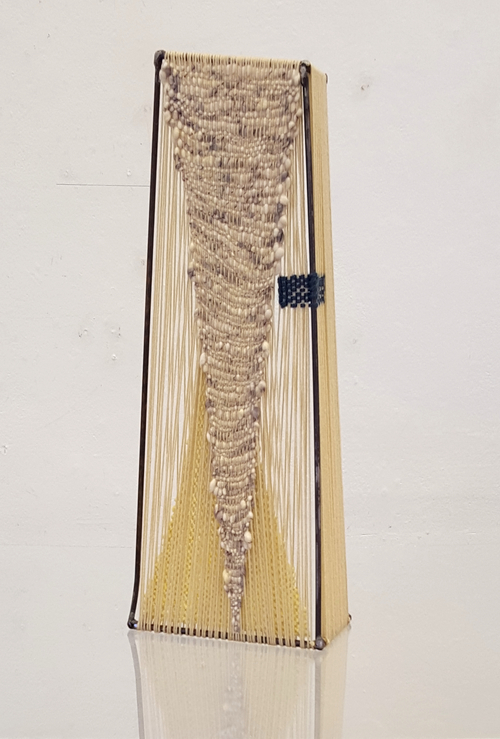 While I am primarily a ceramic artist, I love learning new techniques and dabble in metal, wood, and fiber work whenever I’m able. I am still at university which enables me to develop and refine ideas over time and receive feedback on those ideas from peers and mentors. I operate under the idea of being a life-long learner. There is always a new skill or technique to learn and I want to develop and hone as many as possible. My hands have a life of their own. When I am upset or unable to express myself, I go to work. I believe that materials are a lot like languages and I am far more fluent in clay and fiber than I ever have been able to be in English. As a ceramic artist I think about the idea of functionality a lot and how that idea can be translated or talked about in different ways. In the majority of my work that idea expresses itself in conjunction with the idea of womanhood and what it means to be female. I created these works in response to an event that I could not, and still do not understand. I am passionate about art-making as a means to understand or begin to understand ideas, emotions, and events. I believe that we are a visual and tactile people, and art-making is a necessary part of life that should be nurtured. Ceramic, Mixed Media. Image Courtesy of the Artist. I get most of my inspiration from poetry, history books, and novels. I have always loved to read, and find great solace in diving into someone else’s story. I am always looking for a new book to read, and if anyone reading this has any suggestions feel free to contact me with book titles! I have also been teaching art in some form or function since I was 16, to students ranging from 4 to 18. Although only a few years separates me from some of my students I walk into the classroom every day knowing that they are going to teach me something new. I am continually in awe of what they are capable of creating, and constantly think about their role in the world and how I am influencing it. From the Dysfunctional Pottery series, pit fired ceramic, woven. Image Courtesy of the Artist. This is always such a hard question for me to answer; Christo and Jeanne-Claude, Judy Chicago, Gustav Klimt, are up there, but I always come back to Rothko. I have grown up visiting the Rothko Chapel, and it has a special connection to this work in particular. I go to the Chapel to seek out comfort. Rothko paintings have always been a space of reflection for me. In the absence of content I find my emotions projected back at me, the colors enhancing and shaping my moods. I have never found a space more liminal or inviting as a Rothko Chapel, and the solace I have found there throughout my life always keeps me coming back. Steel Frame, Woven. Image Courtesy of the Artist. 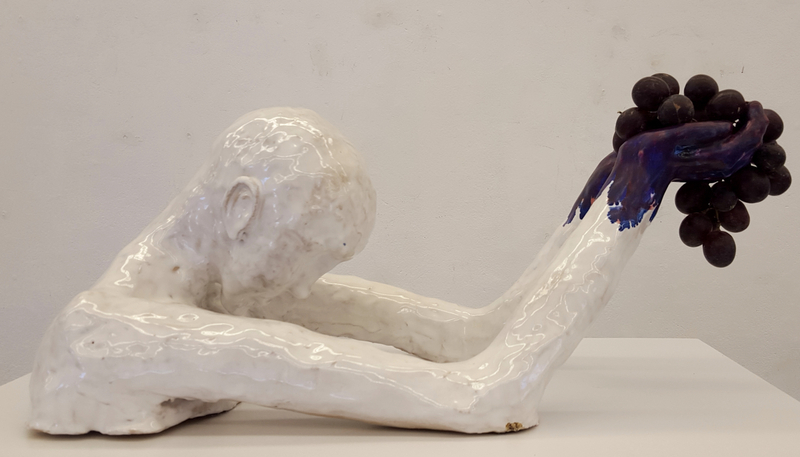 In addition to the exhibition at Provenance Gallery, you can see more of Grams' work at the closing reception of her BFA Exhibition on Friday, December 16th. On Saturday, December 17th, Grams will be selling pottery and small woven jewelry at the Guadalupe Cultural Arts Center. She will also be showing new work in the S.M.A.R.T. Studio Space during Second Saturday in February. Visit her website www.elysegrams.squarespace.com or follow her on instagram @lyseygirl to see work in progress and pictures of some of her favorite art around the city.